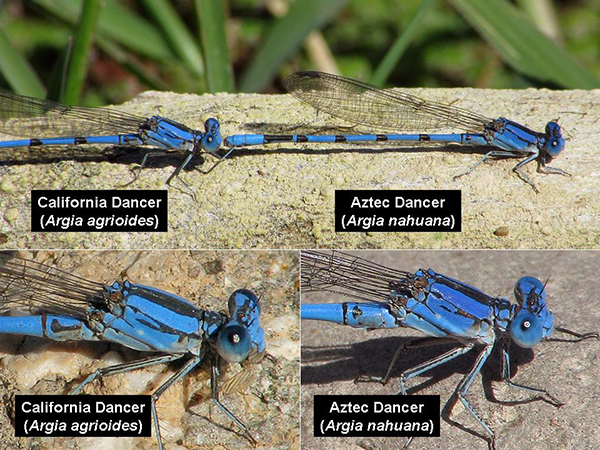 The Aztec Dancer is closely related to the California Dancer. The two species in Arizona are often found at the same locations and they behave similarly. The Aztec and California Dancers often, but not always have a forked black humeral stripe. To differentiate the two species, examine the black marks on abdominal segment 2 (S2) and, in males in the hand, the tip of the abdomen. See pictures of each species for examples. Aztec Dancer: pair of lateral black round spots. Mature male California and Aztec Dancers, AZ. Aztec Dancer: gap between tori narrower than tori themselves. Dorsal views of the male appendages of the California and Aztec Dancers, AZ.